I took Wednesday an Thursday this week to unplug completely and spend some great quality time alone with my hubby. My mom came out to our house early Wednesday to watch the kids and we were off on our adventure. Our destination: The beautiful Hocking Hills here in Ohio. If you have never been there before....I cannot recommend it enough. It's as if you have been transported to a rain forest in some secluded county. You will be awe struck by it's sheer beauty! Our first day there was a bit drizzly, but it certainly didn't hamper our enjoyment of the caves. We spent the first day at Old Man's Cave and Cedar Falls. After our hike, we headed to our super cute and equally as cozy cabin. We have been going to Getaway Cabins since 2001 when we took our first trip there for our 1 year anniversary. This time around, we stayed at The Retreat. By unplugging, I certainly mean we were utterly and completely unplugged. There is no phone in the cabin, we had no cell signal and we could only get 2 channels from our rabbit ears on the t.v. Let me tell you....it was soooo nice! We were awakened in the morning by what sounded to be a monsoon outside. It was raining sooo hard! However, that just made us want to sleep in even more...which was nice. Once it slacked off a bit we decided to check out and hit up one more cave before heading home. This time we went to Ash Cave. It's is stunning! 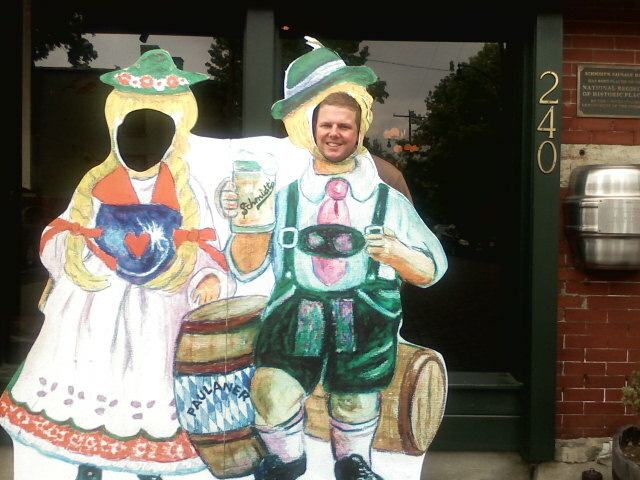 On our way back home, we decided to stop in German Village and eat lunch at Schmidts Sausage Haus. Talk about YUMMY! We stuffing ourselves full of 5 different types of bratwursts, German potatoes, and Corned Beef and Cabbage. Barely able to move, we decided to walk around the village and look at all the beautiful houses. If was so nice to get away, but it was also very very nice to come home. The best part was walking in the door and seeing my kid's faces and seeing them run to us with their arms wide open!! Oh WOW! That waterfall is AMAZING!!!!! You picked such a beautiful destination and I have to admit because of you I am considering going to Ohio! So glad you and Hubby were able to recharge =) Looks like you had a beautiful time! Also have to send a big Kudos to your Mom for helping you unwind- now THATS a blessing! Your pictures are breath taking. I so want to got there. We went to Deep Creek Lake Maryland a few years ago and it is just as gorgeous. I have been trying to talk the Hubby into going there but I have not succeeded yet, and it's only about a 2 to 3 hour drive I do believe.